Find and compare the best prices from a range of well known car rental companies at Rhodes Airport. This is a free to use facility, enabeling you to book direct with the company quoting the price. The airport was built in 1977 and a new terminal was opened in 2005 to cope with traffic levels, which make Rhodes one of the busiest airports in Greece. 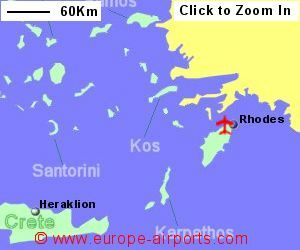 A bus service connects the airport to Rhodes town(a 40 minute journey and the bus stop is 300m from the terminal). 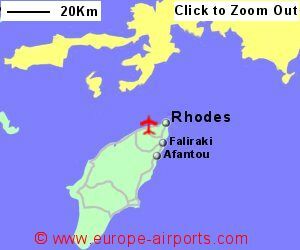 A taxi into Rhodes is likely to cost 30 Euros. Rhodes airport has a restaurant/cafeteria, shops, banking/currency exchange facilities, and left luggage. Passenger numbers at Rhodes airport totalled 5.3 million in 2017, an increase of 6% compared to the previous year.